Former president Asif Ali Zardari and his sister Faryal Talpur on Tuesday appeared before banking court in a case pertaining to money laundering through fake bank accounts. Talking to media outside the court, ex-president termed mini-budget recently unveiled by the Pakistan Tehreek-e-Insaf (PTI) government as ‘mini drama’. He said that the incumbent government has failed to maintain the ties between Pakistan and India. On the occasion, stringent security measures were made to avoid any untoward situation. 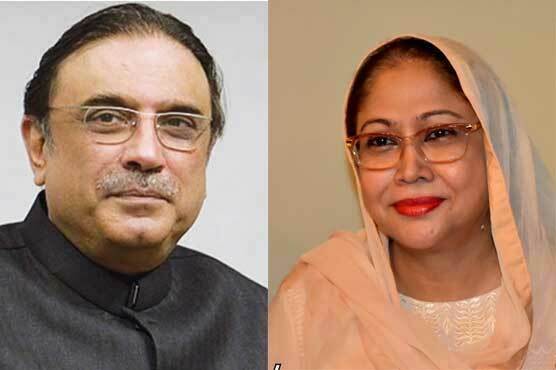 Earlier, a session court in Karachi had declared Asif Ali Zardari and Faryal Talpur absconders in the case while Omni Group Chairman Anwar Majeed along with his son Abdul Ghani were arrested from Supreme Court (SC).